When performing either left or right transperitoneal laparoscopic live donor nephrec-tomies, both the operating surgeon and assistant stand on the abdominal side of the patient. The equipment table is positioned at the foot of the operating table, and the scrub nurse stands opposite the surgeon. This allows the scrub nurse to hand instruments directly to the operating surgeon. 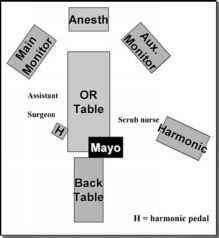 The main video monitor should be placed at eye level, near the head of the table, opposite the surgeon. The secondary monitor is placed in a similar position on the other side of the table, allowing the scrub nurse to also monitor the surgical procedure. A standard monopolar electrocautery unit and/or a harmonic scalpel generator are placed either in front of or behind the operating surgeon. A typical operating room configuration for a left laparoscopic donor nephrectomy is shown in Figure 3. Some surgeons use the AESOP™ a robotic arm to control the laparoscope during laparoscopic live donor nephrectomies. In these cases, the robotic arm should be attached to the operating table on the surgeon side at the level of the patient's shoulders. Its position must be monitored throughout the procedure to ensure that no pressure is being placed on the patient's hands, arms, or shoulder as the robotic arm is maneuvered. 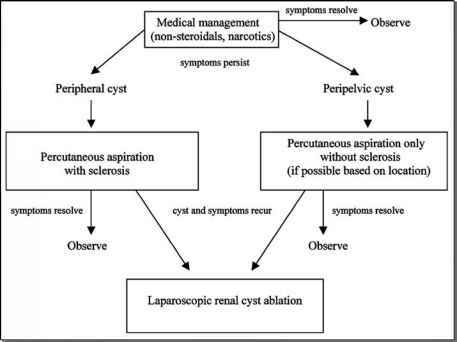 FIGURE2 ■ Patient positioning for left-sided laparoscopic live donor nephrec-tomy. Patient is secured to the operating table and all pressure points are well padded. Extraction site is marked prior to positioning. The anesthesiologist should be instructed to maintain a urine output of 100 cc/hr. This will keep the potential allograft well hydrated and keep the renal vein appearing full and make it easier to identify during the dissection. The extraction incision site should be marked prior to positioning and rotating the patient to ensure symmetry and a good cosmetic result. FIGURE3 ■ Operating-room configuration for left-sided laparoscopic live donor nephrectomy.